Someone is stealing Teddies. But who is the Teddy Robber? Tom is going to find out (with the help of his torch). A friendly warm hearted and cheerful story that makes the perfect bedtime store-book for young children, Teddies (and Giants!). If you need more information about it then please ask your questions. Pages have yellowed over the years. Published in 1976. Made and printed in Great Britain by William Collins Sons & Co. Ltd. Glasgow. Hard book with dust cover. Some of the first pages have been bent at top. If you need more pictures then please ask - does not detract from reading the story. The dustcover does show wear at it is nearly 40 years old. Published in 1982 by Popular Press, Paulton Bristol. Made and printed in Great Britain by Purnell & Sons Ltd. Paulton Bristol. Lots of lovely big pictures of Noddy and all the characters. Name of original owner on inside of front cover. 5 exciting stories in large print and large beautiful pictures. Scribble on inside cover from a previous owner, spine starting to come away on inside and back cover. ﻿1997 Printed and published by DC Thomson & Co., Fleet St, London. Published in 1989 by Budget Books, and printed in Hong Kong. No rips or tears, appears in almost brand new condition. If you require any further information, then please ask. ﻿Published by Brimax books, Newmarket, England. This is a vintage adventure story book based on the well known 1950's television series "Circus Boy"
The lead child star was Mickey Braddock (Dolenz) who later became famous as one of the 4 lead singers of the popular Pop group called "The Monkees" He had then changed his surname to Dolenz. There are 17 exciting stories. Made and printed in Great Britain by Purnell & Sons Ltd. Paulton (Somerset) and London. Copyright 1958 Screen Gems Inc. Published by arrangement with Western Printing and Lithographing Co., Racine, Wisconsin, USA. Name of previous owner on one of front pages. Please email if you require any further information. Large hardcover childrens pictures story book about Black Beauty. 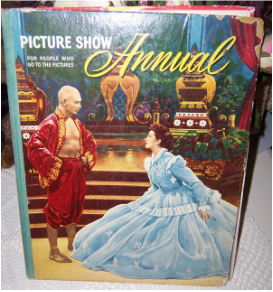 Especially edited for The Golden Picture Classics by Barbar Nolen and illustrated by Tom Gill. Published by arrangement with Simon and Schuster Inc and Western Printing and Lithographing Co., Racine, Wisconsin, USA. Made and printed in Great Britain by LTA Robinson Ltd. London. Name of original owner on inside page. 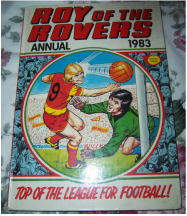 This is a vintage children's annual for Soccer fans in 1983. Published by IPC Magazines Ltd, London, England. Sole Agents for Australia and New Zealand; Gordon & Gotch Ltd., South Africa; Central News Agency. Printed and bound in Holland by Vlazveld and Co., Rotterdam. It has lots of stories, comics and photos of players of that era. The Annual books were usually printed at Christmas time and they were a much loved favourite anticipated Childrens book from Santa or a loved relative. They usually had cartoon stories, short stories to read. 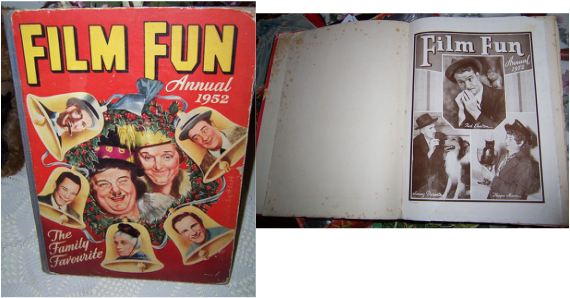 This book Film Fun was printed in 1952 which makes it over 60 years old. It has many cartoon stories in it of the film star characters such as Abbot & Costello, Laurel Hardy of the era. and short stories as well. The book has aged marks on it, and some pages have come away from its spine. It is in black and white. This Picture Show Annual was for the people who went to the pictures. It was probably an early version of a gossip magazine. It has many pictures and stories of the famous actors/actresses of the time with their families. It also has large pictures of them with their signatures on the page. If you are a film buff of the era they would look wonderful framed. Robert Wagner and many many more. The book has many pages coming away from the spine but are not ripped so the pages are still in good condition. This set of books is just magnificent, and if you enjoy the pictures and stories of May Gibbs then these volumes are for you. This is a boxed set of two (2) large hard cover books with their dust covers.